The Wolf River begins in Holly Springs National Forest in the red clay hills of Benton County, Mississippi. Fed by artesian springs, the river flows north into Tennessee then travels 90 miles westward to its mouth at the Mississippi River in downtown Memphis, Shelby County, Tennessee. Maps drawn by the first European visitors to our region gave the Wolf River a variety of names. These included the Chichica (or Chickasaw), the Margot (French for “Blackbird”) and the Nashoba (Chickasaw for “Wolf”). As English-speaking settlers began to dominate the region, Wolf River became the official name. By that time, the red wolves that inspired early mapmakers had been extirpated from west Tennessee. There is a legend that the Wolf River was named by early French explorers for a Chickasaw guide named “Loup;” when English settlers arrived, they simply translated the name into English: loup means wolf in French. Our region’s first people used rivers as aquatic highways and reliable sources of food. Bluffs overlooking rivers were favored sites for villages and trading centers. Woodland bison, eastern elk and ivory-billed woodpeckers lived in the bottomland forests. Black bears and Bachman’s warblers took shelter in the river’s dense canebrakes. Wolves and mountain lions prowled the wooded bluffs. A vast network of forest and swamp surrounded the Wolf and its sister rivers to the north — the Hatchie, the Forked Deer and the Obion. When the first Europeans arrived in this area — the Spanish under Hernando DeSoto in the 1540's and the French under Jacques Marquette and Louis Joliet in the 1670s — the rivers and forests of the “Western Territories” seemed to be a trackless wilderness. In fact, these lands had already provided food and shelter for many generations of people. Prehistoric cultures once existed along much of the Mississippi River Valley. These ancient Mississippian people are now known as Mound Builders because they built elaborate elevated cities. The origin of the Mound Builders remains a mystery. Their sudden extinction in the mid-1500s was likely a result of the European diseases carried by DeSoto’s armies. The Mound Builder culture was replaced in our region by more recent immigrants such as the Choctaw, Chickasaw and Shawnee. Ancestors of the Chickasaw are thought to have traveled to this area from Central America. Their descendants ha already established a complex civilization when the first European settlers began to arrive in what is now Tennessee. But the Chickasaw and other native people were rapidly decimated by the introduction of deadly new diseases, and were ultimately forced to leave their homelands by the United States government when the Indian Removal Act was passed in 1838. One of the routes of the infamous Trail of Tears, in which U.S. soldiers herded thousands of native people from the southeast to reservations in the west, was an overland trail that is now Poplar Avenue (Highway 57). Rivers can flow in any compass direction, but waterways of all types and sizes have one thing in common: they always flow downhill. A river valley is formed by the eroding power of water that is responding to the force of gravity. When a river is confined by a rock substrate, it carves a deep canyon that changes course over very long periods of time. But when a river flows across a soft bed of alluvial soil, as does the Wolf, its channel meanders back and forth across a wide floodplain and can change course rapidly. The floodplain forests along the Wolf are composed of plant species that have adapted to the seasonal flooding that usually occurs in winter and spring. 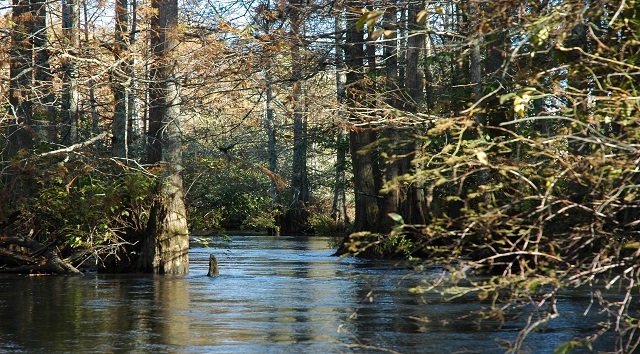 There are two main types of floodplain forests in the Wolf watershed: cypress-tupelo and bottomland hardwood. True wetland tree species such as bald cypress and water tupelo are able to live in wet conditions for much of their lives. Hardwood trees such as swamp chestnut oak and water oak are very tolerant of flooding but cannot survive a constant aquatic habitat. Bottomland hardwood ecosystems exist at a slightly higher and drier elevation than cypress-tupelo ecosystems. When you visit the floodplain of the upper Wolf, you will notice a “high water mark” on the tree trunks. This mark is created when silt-laden sediment is left behind after floodwater recedes, and it indicates the normal level of seasonal flooding. If a forest is located in the 100-year floodplain of the Wolf River, there is a one-in-a-hundred (or 1%) chance that it will be flooded in any given year. Floods often cause problems for humans who build homes too close to rivers, but seasonal flooding is an essential agent of change in the natural world. Seasonal flooding in a bottomland forest is a method of cleansing and renewal: it prevents the growth of water-intolerant invaders such as kudzu, privet and honeysuckle while enabling the dispersal and germination of native plant seeds. A vital component of the Wolf River’s floodplain ecosystem is the open marshland, or swamp, that is formed when beaver dams or the natural buildup of sediment cause a stream’s flow to slow down. This type of wetland hosts a diverse array of aquatic plant species and provides shelter and food for a myriad of aquatic creatures. When the Wolf overtops its banks, the wetlands in its floodplain act as a giant leafy sponge to soak up the excess water. This slowing and storing of floodwater prevents property damage along rivers, provides an essential “recharge” period for the underground aquifers that contain our region’s drinking water, and enriches the floodplain with the silt and nutrients that are left behind when a flood subsides. Following the massive deforestation of west Tennessee in the late 1800s and early 1900s, rates of upland soil erosion increased dramatically. This eroded material was deposited in the floodplains and choked the sinuous river channels with sediment and debris. The increased flooding that resulted led to efforts to reduce flooding by deepening and straightening river channels, a practice commonly called channelization or ditching. In the late 1940s, the U.S. Army Corps of Engineers created the West Tennessee Tributaries Project to coordinate channelization projects in our region. Substantial losses of wetlands and bottomland hardwood forests resulted from these flood-control measures — especially in the Forked Deer and Obion river systems — which enabled the profitable farming of former wetlands and the expansion of urban development into floodplains. Today, every river system in west Tennessee has been negatively impacted by channelization and wetland drainage. Only the Wolf River and its big sister, the Hatchie River, remain largely unchannelized. By 1964, the Corps of Engineers had channelized the lower 22 miles of the Wolf River, creating an artificial canal from the river’s mouth upstream to the city of Germantown, Tennessee. In the late 1970s, local authorities cleared and dredged portions of the Wolf’s meanders as far upstream as Moscow, Tennessee. Many of the tributary streams of the Wolf were transformed into ditches in order to drain farmland and urban areas more quickly. Although these projects were intended to reduce flooding in the river system by increasing the “flow efficiency” of the main channel and its tributaries, the results were very different. After the channelization of the lower Wolf, major floods did occur less often in the upper reaches of the river system. However, the increased flow efficiency and elimination of wetland “storage” areas in the floodplain meant that floodwater began to travel downstream much faster than the lower channel could receive it. As a result, the lower river system now experiences more frequent flooding of greater depth and duration than it did before it was ditched. Thus, the flooding problems that were used to justify river alteration in the first place were actually made worse in many areas by the intended remedy of channelization. The only real solution is to stop farming and building houses in the floodplains of our rivers and streams. Floodplains, as their name indicates, are supposed to flood. Why protect the Wolf River? During the early 1800s, much of Tennessee’s well-drained uplands were cleared for cotton plantations and other agricultural crops. By the late 1920s, a bustling lumber industry had felled nearly all of our state’s remaining old growth forests. This wholesale destruction of natural habitat, when added to the impacts of hunting and trapping, had a catastrophic effect on many animal species. Woodland bison were so common in the southeast United States in the late 1500s that Hernando DeSoto called them the “cattle of the woods.” Eastern elk also abounded. The woodland bison were gone from the southeast by the early 1800s and the last elk in Tennessee was killed in 1864. Red wolves survived in small numbers in the mountains of east Tennessee, but those isolated populations were wiped out by the 1920s. The eastern cougar, or mountain lion, was extirpated from west Tennessee by the early 1900s. Black bears suffered a similar fate. Bachman’s warbler and the ivory-billed woodpecker are presumed to be extinct. The Carolina Parakeet and the Passenger Pigeon (which had a precolonial population of three to five billion) had been hunted to extinction in the wild by 1900. Despite the loss of our old growth forests, and the loss of the plant and animal species that needed such habitat to survive, the Wolf River watershed still provides a healthy home for a variety of flora and fauna. Twenty-five species of native freshwater mussels and more than 200 species of birds have been verified in recent surveys. Bald eagles and ospreys are returning to the area, and the nearly extirpated wood duck is now common on the Wolf. Rare plants such as copper iris and sweetbay magnolia grow in the Wolf’s bottomland forests, and the river itself hosts a variety of fish including rare species such as the naked sand darter and northern madtom. All of these plant and animal species have one thing in common: they depend on protected natural habitat for their continued survival. These species are uniquely adapted to fill a particular niche in the Wolf River watershed, whether that niche is in a leafy treetop or a muddy riverbed, and each species is important to help maintain the balance of the larger ecosystem. When an ecosystem is altered by human activities, such as forest clearing and wetland drainage, the species within that ecosystem are placed at risk. Human activities have destroyed nearly 60% of the wetlands that existed in pre-colonial Tennessee. Wetlands rank among the most threatened ecosystems on our planet. Wetlands support an amazing variety of plant and animal life, and most animal species in the Wolf River watershed depend on wetlands for food or shelter at some point during their life cycle. If we fail to protect the woods and waters of west Tennessee, threatened species such as the lark sparrow and the southern rainbow mussel will go the way of the woodland bison. It is our duty to preserve the many colorful threads that make up our region’s rich natural tapestry of river, swamp, forest and field. There an intricate relationship between the Wolf River and the underground aquifer from which people in the Midsouth receive their drinking water. The aquifer provides water to the river in some places; in others the river recharges the aquifer. Protecting the Wolf River is one way we can help to protect our aquifer - the source of some of the purest and best-tasting drinking water in the world. Healthy wetlands and a functional floodplain also provide protection from both floods and droughts and pollution filtration. Finally, the Wolf River is a tremendous asset for the Midsouth community - for recreational, educational, and economic reasons. The Wolf River Conservancy is a non-profit organization dedicated to the protection and enhancement of the Wolf River and its watershed as a sustainable natural resource. Since its founding in 1985, WRC has been able to protect about 14,000 acres within the 100-year floodplain of the Wolf River. As a land trust, it's chief responsibility is to protect habitat. It raised $4.2 million in 1995 to rescue and create the Ghost River State Natural Area and also helped to establish the William B. Clark Preserve and Lucius Burch State Natural Area. More recent acquisitions include the Cannon tract between Piperton and Collierville and other properties. WRC was instrumental in launching the Wolf River Restoration Project by the Corps of Engineers to mitigate the effects of channelization, and has inspired Germantown, Collierville, and Memphis to create greenways along the Wolf River. One of WRC’s most ambitious projects is the construction of a 22-mile continuous trail and greenway through the City of Memphis following the river.